Rotary Youth Leadership Awards, is a leadership training program that enhances your community's youth leaders leadership and communication skills while breaking them out of their comfort zones and encouraging service above self. RYLA gives students that confidence to spread their ideas of impact to their community and world while becoming life changers in the lives of those that they come in contact with. RYLA is the Rotary sponsored youth leadership training program. RYLA is focused on class leaders who are currently in their junior (11th grade) year of high school. If your club is hosting a student from a foreign country as long as the individual is attending high school (10-12th grades), he or she may attend RYLA camp with the permission and participation of the sponsoring club. The 28th annual RYLA camp will be held at the Salvation Army Heart of the Hills facility located in Welling, Oklahoma just outside Tahlequah, Oklahoma. 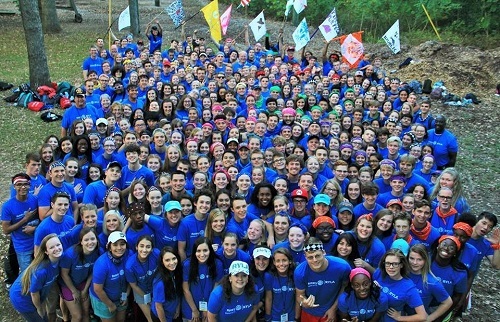 Our camp is looking for bright leaders who have displayed leadership characteristics. We accept students who have outstanding records and are looking for new ways to learn and grow in the areas of leadership, communication, diversity, vision, mission, teamwork, service, selflessness, and ROTARY. Click here view a Video from RYLA 2016 2.0, which gives you a snapshot of what to look forward to! This includes all meals, snacks, lodging, program materials, leadership development through Heart of the Hills outstanding low and high ropes course, all the Rotary knowledge one could ask for, entertainment, and other activities/items. The clubs will need to provide transportation to and from the campsite near Tahlequah, OK.
Click here for additional documentation covering frequently asked questions. Get the RYLA Student Application here.